1 day events have practice in the morning and racing in the afternoon. Typically a 10-12 mile loop with 4/5 timed stages totalling 10-15mins of racing for the fast ones. Ages are taken as age on 31st December 2019 for the 2019 season. All events are “Ride with your mates” when you sign on you also select a start group, we set 12 riders off every 5 mins – you can choose a time that suitable for your group of mixed ability mates. However “Elite” riders must choose the last group, we also advise anyone aiming for a podium to choose one of the last groups too. Early groups are best for the slower riders. The whole point of the group set off is to avoid congestion at stage starts, and the fast riders last means they have less chance of catching slower riders on stages. Is PMBA Enduro for me? PMBA Enduro events range from “Grassroots” to “National” level over the series, a true mix. We hope there is something for everyone and are happy to take questions to help you make the right event choice. All rounds of the series have off-piste stages, ie if you have only ridden trail centre and think a “black” is as tough as it gets you’ll be in for a shock. Natural of off piste stages are unsurfaced and have rocks, mud, roots and can be very technical. Gisburn’s off pistes stages are a good introduction into to racing these sorts of trails if you haven’t before. All events, and all stages will always have “B-lines” round any unrollable drops and jumps so don’t worry if that’s not your thing. R1 Gisburn Forest. 5 stages are planned, 3 trail and 2 off piste. Not too technical so a great place to do your first enduro. R2 Graythwaite Estate, Epic by name, Epic by nature. Full on technical stages set in the most picturesque landscape and idyllic race arena in the parkland in front of the manor house. R3 Lee Quarry and Havok Bike Park, our adventure round, a big loop and fun stages, with plenty of airtime available if you want it. R4 Llangollen, we turn one of the best DH centres in the country to a Enduro Venue. Expect steep, fast stages and a big climb back to the top. R5 Kirroughtree Forest, loam central; another great camping location with many racers taking the family along good to gain experience of off piste trails without being overly technical. R6 Grizedale Forest, , big elevation and technical stages make our final the toughest of the 1 day event of the series. All PMBA Enduro events are available for ages 11+, however we strongly advise that parents entering children under 16 contact us beforehand, so we can advise you of what the event might entail and give you the information you need to make an informed judgement on the suitability of the event for your child. All under 16’s must be chaperoned, the chaperone must stay with the child on the transitions for the full event, and make sure they can ride the stages safely in practice. Chaperones must be 18+ they maybe another racer, or a support rider; we do not charge for support riders. Chaperones can be in charge of multiple U16 riders but all must ride the transitions, as a group. For the U16s Gisburn and Kirroughtree are the most suitable events, while there are immensely talented 12 year olds riding enduro rounds such as Graythwaite should only be entered after serious consideration and discussion with the organiser. Entering the events is really easy, get yourself an account on SI Entries is the first step. All under 18s will need their parent/guardian to create an account and use that account to make the entries. U18s are advised to create their own accounts too. There is a minimum age of 13 to register with SiEntries. Under 13’s parents just needs to register with SiEntries, start making the entry and when asked for the “Person to Enter” select ‘Somebody not registered with SiEntries’. On the next screen they can add all the details of your U13 child. The next time you come to enter their child their details would be saved and come up in the Person to Enter drop down list so you don’t need to type in all the details again. The SI Entries FAQ is also a useful link to have, its here. Do you have a reserve list for full events? We do not run waiting or reserve lists, however we do ask that racers who can no longer attend can sell on the entry (no profiteering) to other racers. We suggest the best place for this is the relevant Facebook event page. These are linked to on the individual event pages of the website here. TOP TIP : Getting the replacement racers SiEntries number, surname and post code from them makes substituting very easy! If the event is cancelled we would endeavour to reschedule if possible, and transfer all entries to the new date. Please be aware that we may be unable to refund or part refund any entry fee. We are also may be unable to transfer your entry to another event. We will always allow entries to be sold on upto 7 days before the rescheduled event, this will be via the “Substitution” button within SiEntries. What and where is my SI number? How do i transfer an Entry? 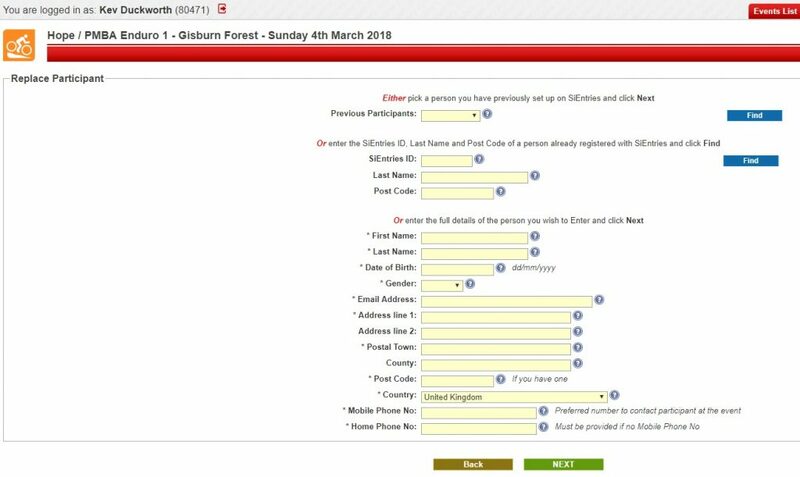 Transferring an entry you have sold is really easy; just login to www.sientries.co.uk and click on “My Entries” select the event, then clocking “Edit” followed by “Edit/Substitute” and finally “Substitute” will get you to the page below. If you have the racers SI ID, Surname and Postcode you can easily find and transfer the entry to them. You’ll still be the entry owner, but the participant details will be transferred over. All events have viewable entry lists, so the 2 parties should be able to see one name swap to the other on the online list. Can I photograph at your events? The simple answer is yes, you can. Spectators can access parts of the course and anyone is allowed to take photographs. You will of course be subject to the same rules as spectators, some area’s will be difficult to reach, and you absolutely will not be allowed to use the course as a footpath to access the other area’s. You also will not be allowed to ride on the stages, you may ride on the transitions. Drones are banned. To have more access than spectators you can register with us, at sign on, to be a photographer and get a photographer wristband. You will be required to read and sign a safety briefing, and show us your documents to collect your photographer wristband. This will not give you complete access, nor free reign of where you can photograph but you will have more freedom. To do this there is no charge from us here at PMBA Enduro, however we do require that you prove to us that you have at least £3M PLI, and that you carry with you at all times, and show us, a risk assessment for the task of photographing an enduro event. Risk Assessment should show knowledge of selecting a suitable and safe place to locate yourself, identifying places a rider may leave the track/crash outside the tapes & safely moving location. We would also expect to see a list of activities to avoid such as “Leaning over tape”, “Standing in a B-Zone” and “Walking down a stage”. Without either of these things a photographer wristband will not be issued, and you will be purely a spectator with a camera. While drones are not completely banned from PMBA Events, if you wish to use one you must be fully compliant with the law and posses the required license, include use of the drone in an extensive risk assessment and follow all guidelines on safe distances. We understand this is very restrictive to the use of drones but it is the correct and safe level to expect from drone users.